Someone called the other day. 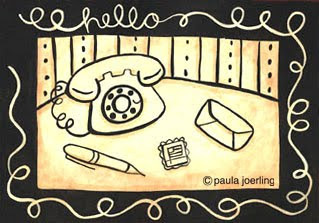 I answered the phone and a male voice said "Hello Paula darling, what are you doing?" I replied that I was just saying good bye to our house guests, Zazel and Robert. The voice said "Ok, call me back" and hung up. I have no idea who it was. Based on the "Paula darling", Tom and I tried in vain to figure out who it could have been. Oscar calls me darling but he has a Spanish accent so it wasn't him, ditto for Jamie but substitute Southern for Spanish. Mark! it must have been Mark. I called Mark and it he said "No, it wasn't me, besides, I call you Miss Jo or sweetie darling". I relayed this to Tom and we started to go through a list of things that my friends call me and that I call them. It brought a smile to my face and, at times, made us both laugh. Make yourself chuckle and go through your list and please, feel free to post in the comments. I would love to hear your names. My neighbors called me Paula Jane (not my middle name) and Poolah. Cousins Sue and Amy call me Paula Walla. Gerbil and Jerkling (one of my favs) are names from gradeschool. Marie, Zipper and PJ are from highschool. Paula Jo, Miss Jo and P Jo came about when I worked for another Paula J. She didn't like being called old or big (she was neither) Paula so the people I worked with started to call me Paula Jo after Sammy Jo Carrington on Dynasty. I call Oscar Puppy or Perrito. Chad has several names-Chadley Chadlington, Chaddykins, Hunny Bunny and Wonder Twin. and naturally there are the honey's, sweeties, darlings etc. We give our friends endearing names that only we call them and they stick. If I don't recognize a voice I know who's calling by how they address me. If whoever called is reading this, please call back. I would love to talk to you. This licensing thing can sure wear a girl out. I have been working on so many different projects that my head is spinning and my studio looks like a cyclone just passed through. There is ephemera, research material, tubes of paint, colored pencils and coffee cups scattered hither and yon. Unopened mail adorns my desk and little pieces of paper, with what I am sure are very important notes written on them, are everywhere. The problem with freelancing is that you never want to say no to anything that comes across your desk because you never know which project might take hold and grow into something big. Just when you think you're on schedule and might have time to make something for fun, an email comes through and someone is asking if you have any, oh I don't know, frog, illustrations. You reply "of course I have frog illustrations" and get to painting frogs; a subject that you may or may not be particularly fond of. If they like your frogs then great, you have a frog line. If they don't then you have a bunch of frog paintings to add to your portfolio. Now don't get me wrong, I love what I do. My worst day in the studio is still better than the best day working for somebody else but there are times when it feels like I'm working hard for no money. If the little froggy's are chosen it could be 6 months to a year before any kind of royalty revenue shows up (not a complaint, simply an observation) and by the time it does, the frogs have all but been forgotten about. In other words there is no immediate gratification and we all need that every now and then. I keep telling myself that I am only going to paint what I want to paint and concentrate on projects that really grab me but that is usually easier said than done. I'm getting better though, really I am. I actually said no this week and it felt pretty good. Now I think I'll clean the studio and get some of that instant gratification that I'm so fond of.